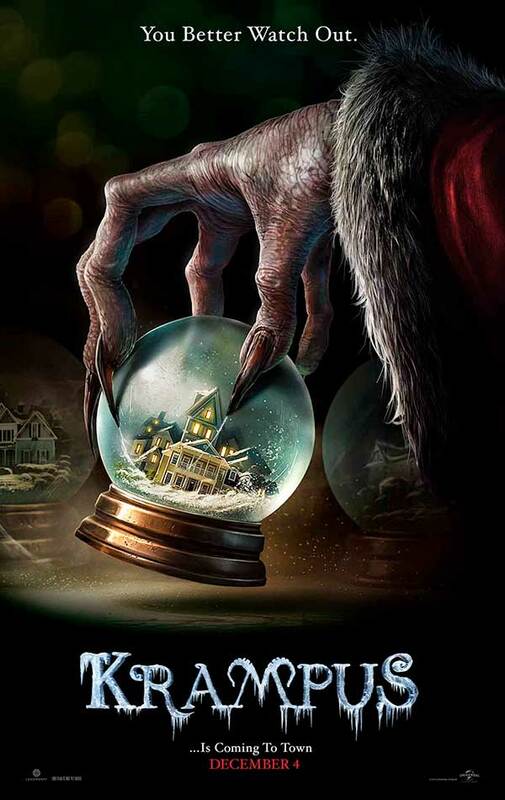 Krampus is about a suburban family gets together a few days before Christmas and no one seems to have the Christmas spirit except for a boy and his grandmother. The boy inadvertently summons an ancient demon known as Krampus. The demon and his minions go about destroying this family by taking them away one by one. Krampus has been on my list of must sees for a while now. I finally took some time for myself the other day and planned a movie night. I spent a couple of hours deciding on what to watch later that night because in the hopes that taking some time would increase the chances of choosing some good movies. I chose 3 titles. Krampus was the first one I watched that night and I can’t stress enough how pleasantly surprised I was. I was pretty sure about minute into the movie that I was going to like it. The Christmas music playing, the direction and cinematography just set the tone for the film. Very well made. the whole night was a pleasure as for the first time in a long time every film I choose to watch was really, really good. There just isn’t anything to really complain about in Krampus. It’s not really a kids movie though. It’s appropriately rated PG-13. I think some of the images will be too strong for the little ones. But, teens and above will enjoy it. I enjoyed it so much that Krampus has just made it on my coveted Christmas watch list. It goes right up there with It’s a Wonderful Life, Holiday Inn and Die Hard. The cast is great. You will love/hate Conchata Ferrell as Aunt Dorothy. She plays a fine line between annoying and hilarious. I just can’t say enough about the entire cast. Toni Collette as Sarah Engel, again plays a mother and though this role isn’t as dramatic as The Sixth Sense her acting is as usual carried out with believable perfection. Adam Scott as Tom Engel, the husband/father, is great as always. He manages to play a husband and father who has grown bored and tired of his life while still allowing us to understand where he’s coming from and care about his character. I just can’t label any single performance of the cast as a standout role. Everyone from all the kids to all the adults nailed their parts. Great casting. This movie is like a cross between Christmas Vacation and Hellraiser with a hint of The Nightmare Before Christmas. Not as funny as Christmas Vacation or as scary as the Hellraiser but it’s got just the right amount of each. Funny, creepy, some nice dialog and a great ending. I can’t stress enough how import endings are. I watched a horror movie last night that was slow but really interesting and then ending sucked hard. It was obvious the writers just had no idea how to end it, so they went with a cheesy jump scare and rolled the credits. It ruined the entire movie. I will be reviewing it soon. So, who’s going to like this movie? I would think anyone over the age of 8 or 9 is going to like it. I am not saying I think it’s okay to sit kids that young down and let the watch this alone. PG means parental guidance. Watch it with them first. Other than that, everyone else should love this movie. Except those that don’t like horror movies or good movies. Krampus is just a perfect blend of fun and scares.